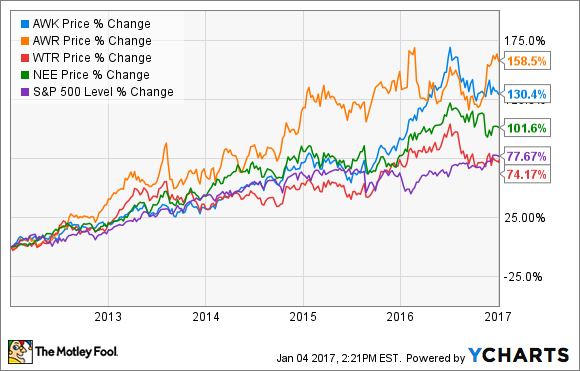 These five diverse industrial companies have two things in common: strong dividends and good share-price outlook for 2017. The ball has dropped, the bubbly has been sipped, the confetti has been swept up ... and that means it's time to start investing! But what should you add to your portfolio this year? Dividend stocks are good -- and often safe -- places for your cash. Here are a few diverse industrial companies to consider investing in for 2017. Each not only pays a solid dividend, but also anticipates a strong year ahead, which could lead to share price appreciation as well. Companies that pay dividends to shareholders outperform non-dividend payers over the long run. Image source: Getty Images. Everybody's heard of General Electric (NYSE:GE), but most people think of it as a maker of light bulbs and refrigerators. Not anymore. GE sold its appliances unit to Chinese company Haier last year, and there's speculation that its lighting business might not be far behind. Today's GE has also shed both its stake in NBC Universal and the consumer credit card business that many investors didn't even know it had. Now, the company is focusing on its core industrial businesses, manufacturing things like power turbines, locomotives, and aircraft engines. But GE isn't just pursuing an "out with the old" strategy. It's also "in with the new" as it makes strategic investments in high-tech fields like cloud-based industrial apps, 3D printing, and biotech. The company has been deriving more and more revenue from high-margin software and services, and has even branded itself "the digital industrial company." Some of the stuff it can do with its new digital capability is jaw-droppingly cool. While GE was untangling itself from its GE Capital lending businesses -- a process that was fundamentally completed last year -- it froze its dividend. However, in the final quarter of 2016, the board approved a $0.01 quarterly increase. While that's nothing to write home about, it may be a sign of good things to come. And jumping on now for the ride starts you off with a 3% dividend yield. Also, GE has so far paid shareholders less than $13 billion of a promised $35 billion in dividends by 2018, with additional share buybacks promised. That should boost the share price as well. Now that it's free of its GE Capital obligations and putting additional focus on its digital strategy, General Electric looks to have a bright future for the long-term investor. Trash is something we all want to get rid of and not have to think about. Which makes it incredibly lucrative for waste haulers Waste Management (NYSE:WM) and Republic Services (NYSE:RSG). They're the No. 1 and No. 2 waste-management companies in the U.S., respectively, and they both had a stellar 2016. Waste Management's shares were up 32.9% and Republic's were up 30%. Both are predicting another strong year in 2017. Unless your portfolio contains a very large basket of stocks already, you probably don't need to buy shares in both, but it's a pretty tough call as to which one you should pick. Waste Management is the market leader, with a $31.4 billion market cap and an ever-so-slightly higher dividend yield of about 2.31%. Its free cash flow generation is amazing, and just keeps increasing, from $1.4 billion in 2015 to an estimated $1.6 billion-$1.7 billion last year, which means the company can afford to keep raising its dividend. Waste Management is also actively working to reduce the drag on its finances from wastewater leachate and low commodity prices for recycled goods. Republic Services is quite a bit smaller, with a $19.4 billion market cap, but it still sports a 2.24% dividend yield. Republic has been growing its dividend faster than its larger peer -- from $0.84 a share in 2011 to $1.24 a share in 2016, a 47.6% jump. The company is also predicting growth in 2017 as it offers revamped contracts and a host of digital service options to its customers. If those are favorably received, that would allow the company to potentially reduce its already-low churn rate. Honestly, given the continued potential for share-price increases, dividend growth, improved operations and possible growth through acquisitions for both companies, investors probably won't go wrong picking either. Despite being by far the largest publicly traded water utility in the country, American Water Works' share price has climbed almost 130% over the last five years: big growth for an already-large company in a staid industry. And the company is still projecting 7% to 10% EPS growth through 2019. The price drop it took in the second half of 2016 may have created a good entry point here. Meanwhile, American States Water -- the third-largest publicly traded water utility in the U.S. by market cap -- saw its stock price surge in late 2016 as California's Public Utilities Commission approved a rate increase through 2018. Since California is the location of the company's only regulated water and wastewater operations, this will have a big positive impact on the company's bottom line moving forward, particularly since California ended its water usage restrictions in June. Both companies have steadily grown their dividends over the past five years -- American Water Works by 63% and American States Water by 72.9% -- and currently sport an identical 2% payout, as well as near-identical P/E ratios of about 27.7. That isn't much higher than that of lower-performing utility peers like Aqua America (the red line on the chart above), at 25.5. In a fragmented industry, large players like these have natural advantages, and both companies can count on the continued need for water to keep their revenue flowing. While dividend stocks are good, sometimes it also pays to keep potential price appreciation in mind, even if that will mathematically lower the company's dividend yield. Either way, these stocks are poised to reward shareholders in 2017... and beyond.